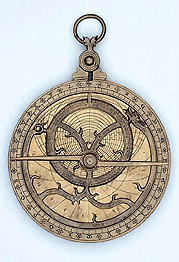 This instrument shows some of the characteristic features of English astrolabes from the later 14th century. These are particularly evident in the rete, where the bands form a 'Y' shape within the ecliptic circle, and outer band terminates in a dragon's head. The band itself represents the tropic of Capricorn, and the far end from the head is usually taken to be the dragon's tail. In this example the resemblance to a tail is not so marked as in other instruments. The tip of the tail and the tongue of the dragon indicate the positions of certain stars (delta Capricorni and beta Scorpii respectively). Capricorn is the goat, and the star at the tail is inscribed 'Denebalg-edi' on this rete, using its Arabic name meaning 'the tail of the goat'. Sometimes the animal represented is actually referred to as a goat, but the visual resemblance to a dragon is much more plausible.